Big bones can be obtained from a variety of NPC's including Hill Giants, Moss Giants, Fire Giants, etc. You can quickly get to the Fishing area of Pre-Scape by clicking on the Fishing icon in the Stats tab. You will need a Lobster Pot which can be purchased from Martin at the Fishing Teleport for 113gp. 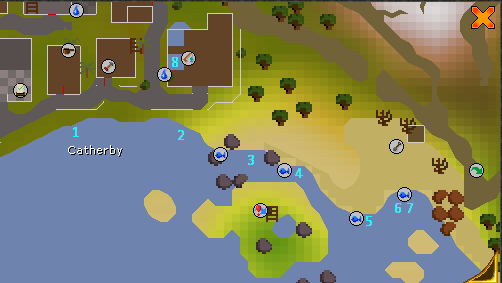 The spot to catch Lobsters is located immediately outside the Shop area at the Fishing Teleport. If you don't have a pickaxe, you can get one by trading Miner Magnus at the Mining teleport. Click the Mining icon in the Stats tab to teleport here. Teleport to the Herblore area by clicking on the Herblore icon in the Stats tab and trade Kaqemeex to open the Herblore Store. You can buy an Ingredients Book from this shop for 1gp and it contains all the recipes for the Potions you can create on Pre-Scape. The shop also contains many Herblore secondaries required to make the various Potions. If you are working through the achievements in order, you will have already completed this achievement during the 'Explorer' achievement where you completed a Dungeoneering floor. Add a player to your Friends List. Use a Special attack using any weapon which has the option to use one. Dragon bones can be obtained from a variety of Dragons throughout Pre-Scape, including Green Dragons, Blue Dragons, Red Dragons, Black Dragons, Iron Dragons, etc. You will need a Harpoon which can be purchased from Martin at the Fishing Teleport for 258 gp. The Chaos Elemental is located in the Wilderness. The best way to get there is to teleport to Spino (via Boss teleports in the spellbook) and then run North east until you’re north of the fence and then run West and slightly North. I recommend making Ruby bolts (e) for this achievement as they are good for bossing/PvM. To do this, buy 1000 Adamant bolts from the Range Supplies Store at home. Then cut Ruby gems into bolt tips until you have 1000. Use these on the Adamant bolts. 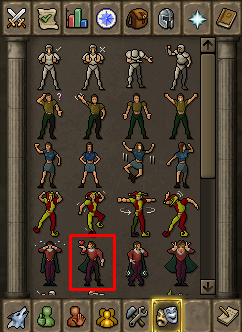 Jad can be accessed by selecting ‘Tzhaar Fight Caves’ in the Minigame teleports section of the spellbook. Teleport here and then enter the cave. If you pray correctly, you shouldn’t need food - maybe just a couple of prayer potions. General Graardor is accessible via the Boss teleports in the spellbook. Select ‘Godwars Dungeon’ and then ‘Bandos’. Kree’arra is is accessible via the Boss teleports in the spellbook. Select ‘Godwars Dungeon’ and then ‘Armadyl’. Corporeal Beast can be accessed via the Boss teleports in the spellbook. It can also be found within the Extreme and Legendary Donator Zones. Rocktails are caught using a fly fishing rod and living minerals. The rod can be bought from Martin at the Fishing teleport (click the Fishing icon in the stats tab). Living minerals can be obtained by killing NPC’s in the Living Rock Cavern (Dungeon teleports in the spellbook) or by trading unwanted Coal and Gold ores at the NPC in the bank at the Living Rock Cavern. Uncut Onyx are obtainable from drops from various bosses including Nex. They are also obtainable from opening the Crystal Chest in the bank at home using Crystal Keys and from Mining. For other players, I recommend obtaining 1b experience in Woodcutting as this is one of the easiest skills and is more or less AFK. The best way to complete this achievement is by barraging Bandits at the Training teleport in the spellbook but you can use whichever method you wish! To complete this achievement quickly, I’d recommend killing bosses such as General Graardor, Glacors, Phoenix, K’ril Tsutsaroth. Once again Lance, you've outdone yourself! An amazing guide with great detail. Wish this was around when i was comping thats for sure! Wow. Very nice guide! This will be helpful as I'm still working towards my comp cape. Keep up the splendid job!